Just say no to overly sweet meatballs; instead, serve these tangy, spicy, kickin’ piquant party meatballs that pack a perfect flavor punch! I got the recipe for these piquant party meatballs from a friend who brought these to party that we hosted for our senior girls and some of their friends. They have become my go-to party meatball version because they are piquant~spicy, tangy, zesty~all of those bold flavors that I love. Many party meatballs are far too sweet; these are loaded with flavor, kick, and just enough heat. Slow Cooker: These party meatballs thrive in a slow cooker. To thoroughly heat, a few hours on low does the trick. The warm setting then keeps these meatballs perfectly hot and ready to eat for hours. My favorite slow cooker to date is this stainless casserole crock. I love the rectangular shape and lower profile. If you have a party on the horizon, give these a try! Just put out some party toothpicks and let everyone dig in. Let me hear back if you try these or have your own fave recipe to share. As always, thanks so much for stopping by. Be blessed, and stay savvy! 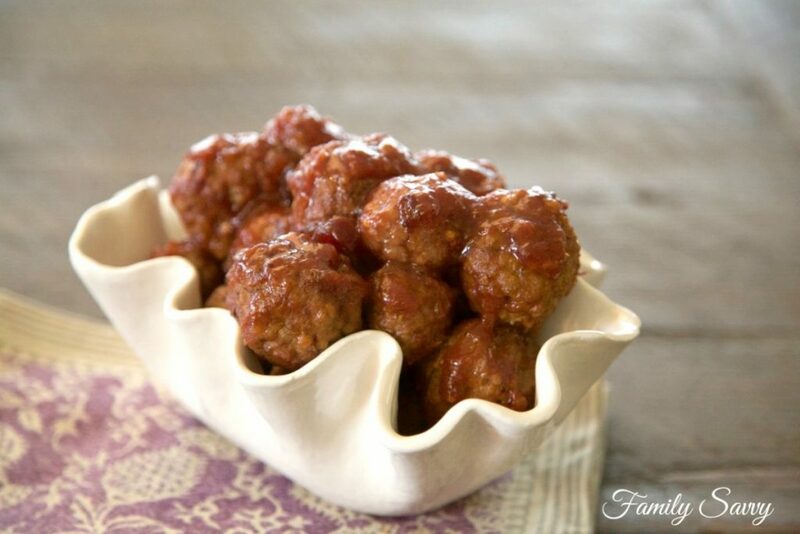 Sweet, tangy, tender meatballs that will be the hit of any party. Place meatballs in slow cooker on low. In bowl, mix all other ingredients for sauce. Pour sauce over meatballs, stirring to coat. Cook on low for 2-3 hours; reduce to warm when cooked through. Keep on warm during the party. Great question; I should’ve specified! If you get meatballs in a normal grocery store, most packages will be roughly the same~so 3 of those. For Sam’s and Costco, I’d do 1. Let me hear how they turn out! What size are the packages of meatballs? I usually buy mine from Sam’s and they are big. Can’t wait to try these. Yum!